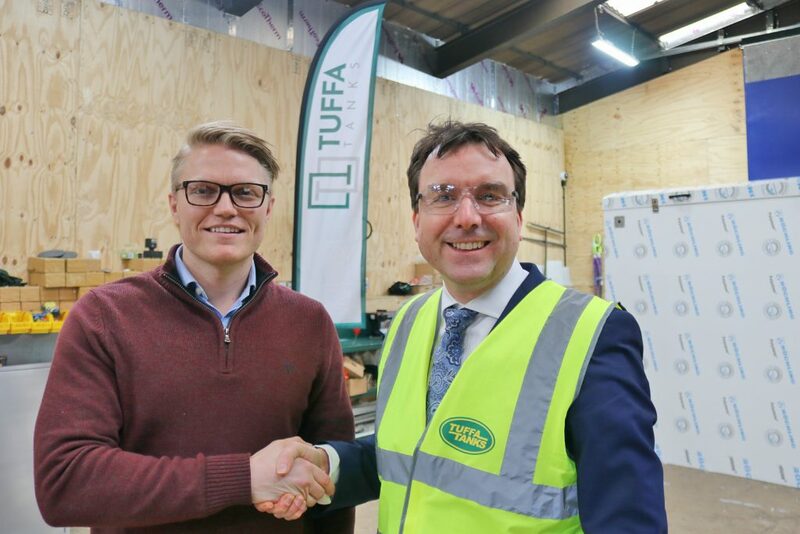 Tuffa UK were pleased to welcome local MP and new Minister for Small Business, Andrew Griffiths, to our Uttoxeter factory last week. Prime Minister Theresa May promoted Andrew to the post of Small Business Minister at the Department for Business, Energy and Industrial Strategy on January 9th this year. Prior to that he was Government Whip from July 2016 and has been the MP for Burton and Uttoxeter since May 2010. 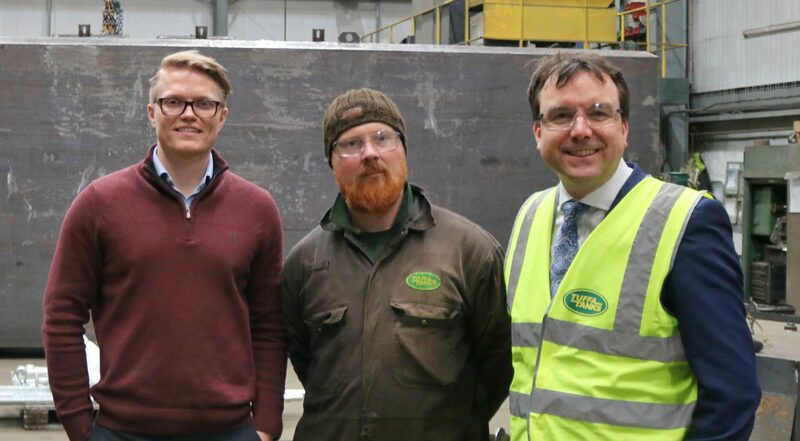 Andrew Griffiths visited Tuffa UK to help celebrate a quarter of a century at our Uttoxeter factory and our recent shortlisting for the prestigious Sentinel Business Innovation Award. expanded the unit as their business has grown. 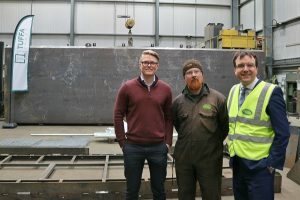 Tuffa has made improvements to the front of the site and extended the factory which now houses the plastic moulds, ovens and workshop, a steel fabrication and welding plant and a new mezzanine production facility for the manufacture of the diesel additive AdBlue tanks. Tuffa UK Managing Director Robert Shenton remembers the move well. 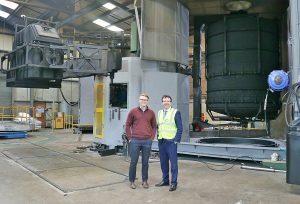 “We were growing out of our existing workshop, and at the time, the Dovefields unit seemed enormous,” he said. “Since then, as our business has grown, we’ve extended the factory by another 20,000 square feet” he said. Last month also saw Tuffa UK shortlisted for a regional Business Innovation Award. The panel of independent judges were impressed with new innovative product design and development that has resulted in a sharp increase in sales. Innovative products include a unique, patented fire-protected material that can be integrally factory-fitted to heating oil tanks. This enables the tanks to be located next to a building for added convenience, security and space saving, while still complying with Local Authority Building Control (LABC) regulations. Fire-protection can also be incorporated into Tuffa’s petrol and diesel tanks. In addition, Tuffa UK has developed a newly designed range of plastic fabricated tanks for the storage and dispensing of AdBlue®, the diesel cleaning additive. This has led to a long term contract with a national AdBlue® garage forecourt supplier. We are also currently developing a new remote fuel monitoring telemetry system due for launch over the next 12 months. Recent projects include supplying tanks for Manchester Airport, the London Olympic complex, The National Trust and The Bank of England amongst many other commercial and domestic clients. 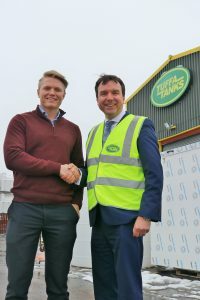 As a result of these developments, Tuffa UK has enjoyed significant growth over the last 18 months, with sales up again by 25% halfway through the current financial year. In addition, we have created 10 new permanent jobs in our factory and office during this period.